3/15/2016: Clay McIntosh's tribute to Sherman Oaks, Mazeppa, and Teddy Jack Eddy. I understand this poster is currently available at Ziegler's. 12/13/2009: DVD Volume 4 of the 'Lost Tapes of Mazeppa' is now available! "Who's laughing now? Final lost 'Mazeppa' tapes released". Order Vols. 1, 2, 3 (TTM review) & 4 on DVD at Mazeppa.com. From Transylvania, it's the The Uncanny Film Festival & Camp Meeting, starring the incredible Dr. Mazeppa Pompazoidi! 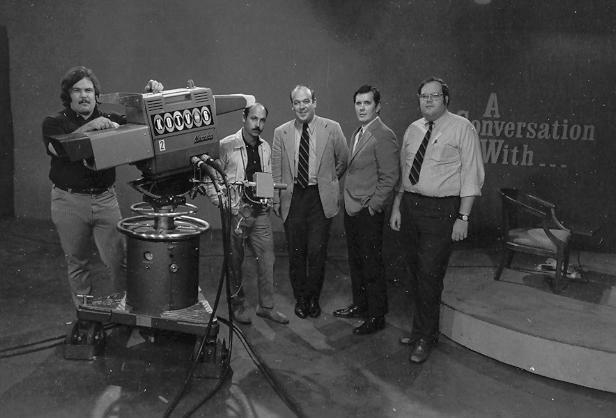 Gailard Sartain, Jr., an art student at the University of Tulsa, started at KOTV as a cameraman, working on Gary Chew's "Go For Dough On the Early Show" at 3:30 p.m., which featured such classic(?) movies as "Billy The Kid vs. Dracula" (read Gary Chew's recent comments on the next page). His clowning around the set ultimately led to the creation of the show. Sartain was 26 years old at the time. See another Gailard Sartain TU yearbook picture. Regarding the name "Mazeppa Pompazoidi": It was the night before the first broadcast and I hadn't come up with what I considered a suitable title. I was at a friend's house and he was going through some old newspapers (1902) that he had discovered in a wall in a cabin in Colorado where they had been used for insulation. One comic strip caught my eye: its title was "The Flip Boys try in vain to play Mazeppa with Fatty Felix" Well, there you have it. The drawing was of a fat kid tied to a donkey. Intriguing and I loved the name Mazeppa. I found out afterwards that Mazeppa is a figure in a classic poem by either Shelley or Keats. In the poem, Mazeppa is tied to his horse and driven from civilization. In the 1880's a stripper used this theme in her act by being bound to a horse and riding across the stage, naked. She called the act "Mazeppa." Pompazoidi ... I just made up out of thin air. How I came to be to KOTV: I was working on my masters at TU endeavoring to become an art professor (with not much luck). 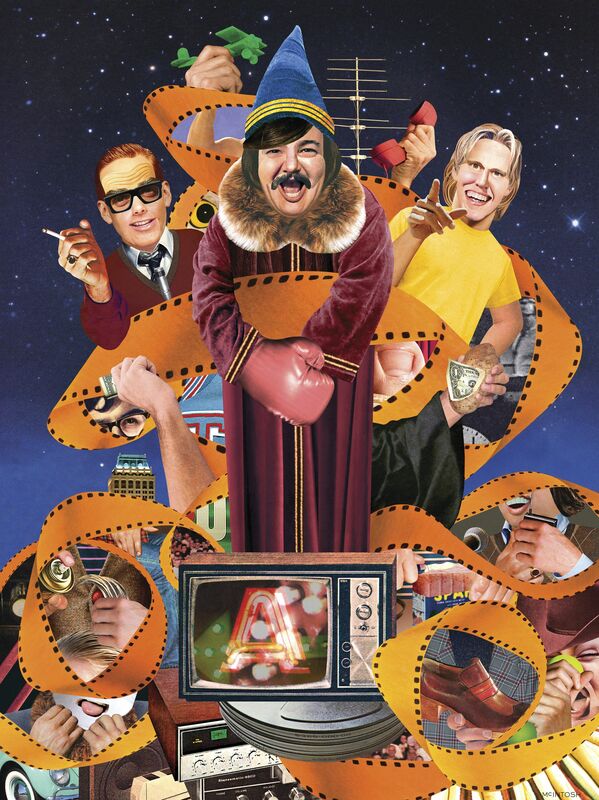 I used to go down to KOTV and fool around with my friend Doug McAllister who was a camera operator on "Go for Dough" (hear an MP3 of the show at the link). Through Doug, I met Gary Chew who was the host and being semi-insane himself, he allowed me to do skits with him on the show. It was pretty free form and Gary was agreeable. Doug vacated his position and I applied for and got the job. ...P.S. Yes, I did work for Hallmark in the Contemporary Card department before going back to school. The show consisted of 45 minutes of loosely-written material and unpredictable happenings during the breaks in "uncanny" films---horror movies. Not that I am under delusions that I was the source of Mazeppa's big break (he was plenty talented on his own). But here's a story. After we had concluded conversation about the development of "Generation Rap", I happened to make the comment that I was a regular viewer of "Go for Dough on the Early Show", not because I liked the movies or that I wanted to know "the count and the amount" in case Gary Chew called, but because of the crazy antics of the camera operator. Other employees and executives in the room turned to the station manager and said, "See. I told you." Shortly thereafter the "Uncanny Film Festival and Camp Meeting" premiered. Seems this strange person kept appearing, unannounced, on our afternoon show. He'd walk across our set in some outlandish get-up, do a pratfall, or pretend to be descending invisible stair steps behind the on-camera personality. Finally, Program Director Art Elliott called Gailard in to say if he was going to occupy that much station air time, he should probably be on the payroll. KOTV, Channel 6, has reincarnated its late, late show on Saturday night for the nonce. The first offering is the classic horror flick, "Dracula." Presumably the show will continue in this genre. The unlikely title they've bestowed on the affair, as it was given to me on the telephone, is "The Incredible Dr. Mazeppa Pompazoid's (sic) Uncanny Film Festival and Camp Meeting." Festival? Who knows? Camp? Absolutely. What's more, stupid, it took you so long to read that title that you've already missed half the movie. Dr. Mazeppa was a wizard with a manic laugh (78K .wav or RealAudio at left). When the show began, his costume consisted of boxing gloves, a fur neckpiece, a sheet, and a pointed hat with a picture of a bat stapled on. Later, he switched to a red suit with a blue wizard's cap. I was always a late night horror film fan as a kid going back to "talking head" host Forrest Lawn and KOTV's Late, Late Show. So imagine my thrill at finding "Dracula" showing on Channel 6 the evening of Saturday, May 2, 1970. I was drawing campaign posters for my brother's senior class president run at Charles Page High School. But when this guy Mazeppa, the nut from Go For Dough on the Early Show, comes on asking folks to send him letters telling him what they thought of his debut show, I was hooked! I wrote a seven page letter and watched with awe the next Saturday when he pulled my letter out of a hopper and announced I'd won an original painting of his movie monster that night, the Wolf Man! Sure enough, it arrived signed merely "Pompazoidi". For about five more weeks he kept giving his artwork away to entities like Intergalactic Thunderbanana but had to stop when he fell behind on the art with the show's growing success. I was incredibly fortunate to be able to write Mazeppa one of his first fan letters and to win the painting. I want to thank Rodney Echohawk for sharing his memories of the embryonic Mazeppa! I remember that first painting on the show - I think we did it in stop-action so it looked like I painted it in ten seconds when in reality it took a couple of hours or so. I'm glad someone like Rodney, who appreciates it, got it. I think I did two or three or more of them - maybe someone out there remembers. While hosting the UFF&CM, Mr. Sartain was also Art Director at Tulsa Magazine. Here is a picture of him with his award-winning cover. The interviewer mentioned his R. Crumb-like painting of popsicles emerging from an ice cream truck. I added an audio loop of the Mel-O-Dee ice cream truck music ("And The Band Played On"), which Tulsans will remember. The film offered on June 7, 1970 was "The Bride of Frankenstein"
Sartain had a gift for creating memorable characters, often based on his observations of the mannerisms of local people. A sample of his characters seen on the show: Bennie the Crusher, a tough-talking pro wrestler, Johnny Donut, the hippest, fastest-talking DJ in town, Coach Chuck, a discipline-oriented high school football coach ("On your belly, on your back, belly, back, back, belly, back...! "), and Hoss Chopwright. Hoss achieved his distinctive look and sound with the aid of a weird half-mask that included horn-rim glasses, and some false-teeth uppers. Hoss Chopright was blabbing away about Greer's when all of a sudden his big old choppers go flying right out of his mouth. He mumbles something like "OH DARN, WAIT JUST A MINUTE" or something like that. Next, you see a shot of the teeth sitting in the bottom of a toilet. A hand reaches in from off camera and grabs the teeth. Next, you see Hoss wearing a long sleeve shirt wet to the elbow stick his teeth back in and go on as if nothing happened. With the aid of a vial of concentrated personality, Mazeppa became John Wayne, Marlon Brando and Ike Horn, a well-known local furniture store owner. Ike also hosted the "Longhorn Wingding", a country music TV show. One applause shot of Ike's audience was repeatedly seen on the Mazeppa show after some particularly ludicrous or bizarre piece of business. One of the half-masks became the head of Sherman Oaks (Jim Millaway), who conducted the public service program "Teen Town Topics". TTT usually featured some outlandish guest, such as Toby the Toe-Headed Boy, or R.B. ("Bob") Beavis. Oaks was never ruffled and frequently chuckled somewhat insincerely at the comments of his guests. 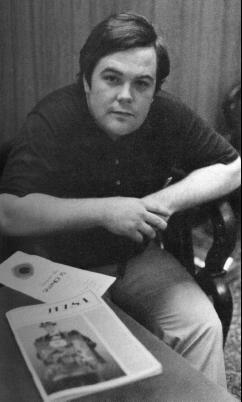 In the fall of 1971, Millaway also appeared as Mr. Mystery, an Oklahoma political candidate. Mr. Mystery wore a ski mask, challenging other candidates to come on the show and try to take off the mask. His idea was that with the mask, people could be voting for him and not even know it. A real Oklahoma patriot, he disliked "Yankee carpetbaggers" and pledged to make every turnpike one-way---out of the state. Another challenge he offered his fellow politicians was to make the race "winner take all"---one elected official in the state of Oklahoma. He sought the support of a minority group in Oklahoma: "you voters out there with an IQ over 95". Campaign slogan: "White space increases readership" (as in the classified ads). It's amazing...Oklahoma politics haven't changed much in 37 years! The Speakeasy Singers on the Mazeppa show. 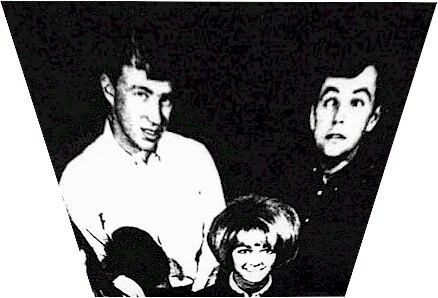 Other characters seen on the show were Laslo Mimne (John Baker), Judy Judy (Judy Owen), and a wandering violin player, Yahootee Menu (Armin Sebran). Later in the run, we saw a waitress (Janey Jackson) and Teddy Jack Eddy (Gary Busey), an edgy, energetic fellow. The unseen announcer was Delmo Gillette (Gary Chew). 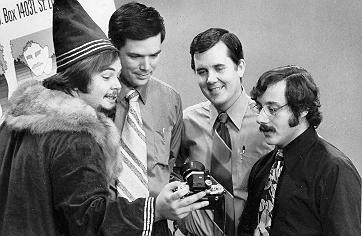 During the show's tenure on KOTV, these characters lurked around as oddball foils for Mazeppa's japes. 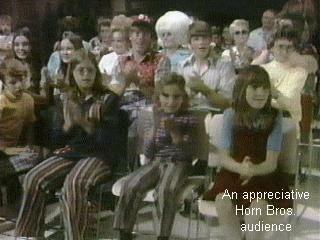 There was a live studio audience for the show in the first year, but this was discontinued. According to Betty Boyd, "the show was such a success that its taping time had to be kept secret to allay mobs of fans who wanted to be part of the action". Yahootee Menu now has his own page, with a RealAudio clip! 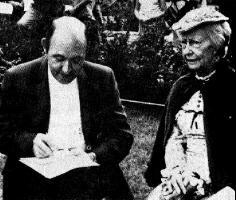 Sorry, I don't remember the lady's name, but she was not a school teacher at Hale. She worked with the sales department as a continuity person. She was there from 9-5 M-F and sometimes on Thursday late, because Thursday was the day we taped Mazeppa. She got to be good friends with the ad agency that repped 7-up, Frosty Mug Root Beer and Greer's Stereo. The pic I sent of the Hale school teacher did not look like the Lil' Dar-lin' I remembered, but, hey, 30 years has been a while. 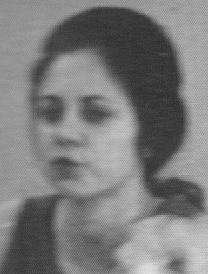 My memory and the yearbook picture are both a little fuzzy, not to mention my TV back in '70. I mentioned in a earlier guestbook that I thought she did work at the station. Roy seems to have confirmed that understanding. Well, I bet the old Doctor knows the answer. Lawzee! Gwen Taylor was working at Channel 6 in the continuity department when I arrived there in 1970. She was a mysterious person with a strange beauty. Perfect for "L'il Darleeng" which she did wonderfully. The information about her marriage to Tommy Loki is correct, and prior to being at Channel 6, she did teach at Nathan Hale High School. 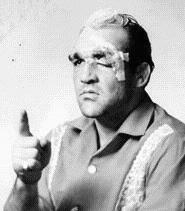 Sputnik Monroe, a pro wrestler, once appeared as a guest on the show. In a bit I was trying to construct with him, he was supposed to 'fake slap' me ... apparently at that point in Professional Wrestling 'fake' was not in the vocabulary! So when it came time for the pay off...KERBOPPO!%*&^)$#. My magician's hat turned into a rocket!!! And the side of my face throbbed for weeks! Sputnik was very apologetic and said 'that's the way we do it'. I've avoided watching or participating in professional wrestling since then. As to the Mack Creager incident that I have been blamed for all these years: I had nothing to do with it. I was at home watching Mannix myself. Everyone thought it was very funny but my heart sank when I saw it happening because I knew the repercussions would be devastating to Mack. He is a wonderful guy and we had a lot of fun together like the time we drove mopeds through the new, channel 6, $20,000 blue screen cyclorama! At least that's what they told us it cost. Some advertiser had left the mopeds there for a spot so Mack and I saw the opportunity and couldn't resist! This was before the 'incident'. 5/10/2005: Gary Chew tells the behind-the-scenes story of the Creager Finger Incident for the first time! My Dad and I used to watch Mazeppa, and I especially remember that someone (from Fort Smith, I think) built an elaborate torture chamber model, complete with trap door onto knives, a rack, a gallows, etc. They sent it in to Mazeppa, and each "feature" was demonstrated on the air. 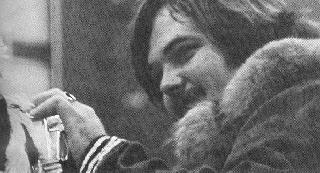 It may have been '71 or '72 when Mazeppa requested cards or letters with which to determine who or what was the typical Mazeppa fan. He asked for answers to several statistical questions and it sounded like something fun to me. I think I remember him saying something about prizes but it was a long time ago. Anyway, I used a 5 X 8 index card and tried my best to provide all the details requested and even included a photographic head shot cut from a larger photo. I had used the moniker of "Bozo Blackbean," and as my most favorite activity I said, "watching the Canopener phlegm festival and cramp meeting." I still remember him some three weeks later, waving my submission in front of the camera and grumbling about how I was the only person to even get close to submitting the correct data, and he began reading from the card - until he got to the last line, favorite activity, and I watched his eyes dart back and forth across the bottom of the card several times. Then he mumbled and said, "and then he wrote something that wasn't funny". I will never forget my 30 seconds of fame. 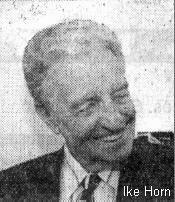 2/5/2004, Anonymous: "The name of the KGGF (Coffeyville) engineer that Gary Chew used was Delano Gillette. He was with the station for many years. 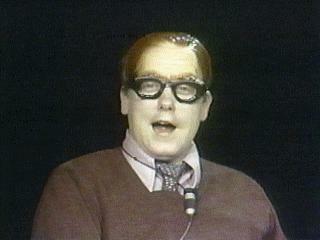 The only one that would remember him that worked with him would be Bill Miller (Wax Works) out of Wichita, Ks. I didn't conjure up the Gillette handle for KOTV's cutting edge late night programming. If my memory serves me on this, it was His Eminence and Great Nurturer of All Things Spiritual, Mazeppa Pompazoidi. Read the Gary Chew interview. He also does film reviews for this site! Gailard Sartain's father was the Fire Chief in Tulsa. 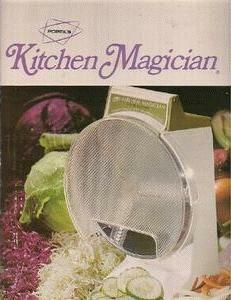 Popeil's Kitchen Magician saves food dollars!